It’s a wonder luxury SUVs survived the mass extinction event of the 2007-2009 recession at all. As investment accounts withered on the vine and fuel prices comfortably boiled past the underside of $5.00 per gallon in some places, chicken-little minded Cadillac Escalade and Lincoln Navigator owners couldn’t have tossed their keys any quicker if you’d told them the fobs were hewn from chunks of raw BPA by pro-choice Iraqi gay-rights activists. Those shining symbols of status and accomplishment transmuted into social millstones overnight, and used car lots quickly piled up with row after row of models boasting 22-inch wheels and seating for seven. But the full-size luxury SUV and its brethren didn’t vanish from the face of the Earth. Far from it. Clever product planners and marketing managers quickly worked to repackage everything buyers loved about their oil-field-sucking family haulers into new, modestly more efficient and socially acceptable packages. Thus began the reign of the crossover. Mercedes-Benz became something of an artisan in this field, and its efforts have been well rewarded. Last year, the company sold more light trucks alone than it did all of its models combined in 2005. At the top of that high-riding food chain is the GL-Class. The mammoth utility services the company’s youngest average buyer at 48 years old and recently eclipsed the aforementioned Escalade as the most popular full-size luxury SUV in the States. For 2013, the GL has grown in every measurable dimension, offers subtly more fuel-efficient drivetrain options and a rash of standard and available technology, all supported by a miracle-working air-ride suspension. The changes are enough to put the GL that much farther ahead of the ancient Cadillac, but the recipe isn’t perfect. The GL-Class serves up design elements lifted from siblings like the ever-attractive CLS. According to Mercedes-Benz, the GL450 soaks up a full 60 percent of total GL-Class purchases, with the remainder divvied equally between the GL350 Bluetec and GL550. As such, we spent the majority of our time with the volume bruiser. All told, engineers stretched the second-generation SUV by one inch fore and aft as well as side to side. The 2013 model also sits half an inch taller than its predecessor, though designers have done a smart job of disguising the machine’s considerable heft. 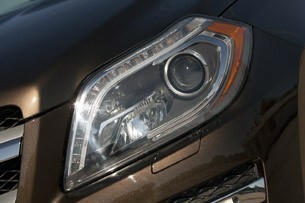 Up front, the GL450 wears a familiar interpretation of the automaker’s vertical front fascia. The two-bar grille is dominated by a Silver Arrow emblem roughly large enough to signal neighboring galaxies, and a mesh lower grille and chrome faux skid plate treatment help break up the front valance nicely.LED daytime running lights are tucked into the lower bumper while projector-beam headlamp arrays sweep discretely into the front fenders. Step to the vehicle’s side and the 2013 GL-Class serves up additional design elements lifted from siblings like the ever-attractive CLS. With a bold body line situated just below the door handles and an aggressive up-kick in the rear flank, the GL avoids any threat of being slab-sided. Blacked-out B and C pillars give the SUV’s greenhouse a flying canopy, while a forward-canted D pillar offers up a few sharp angles juxtaposed to the hauler’s otherwise organic lines. Splashes of chrome from the roof rails and window trim help add a little flare, as do the brushed-metal of the running boards. 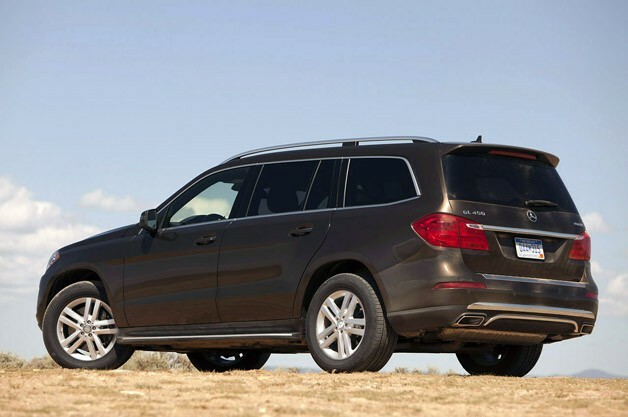 The GL simply doesn’t look as big as it is, despite boasting a 121.1-inch wheelbase. 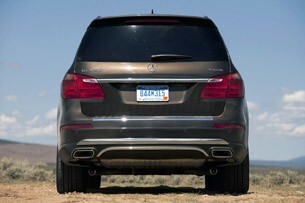 The 2013 GL does lose a bit of its design precision toward the rear, however. 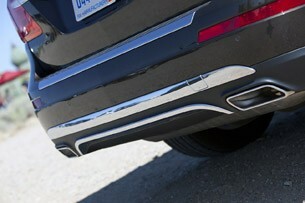 While the LED taillamps are attractive enough, the bulging bumper cover gives the model a distinctly crossover profile. Down low, the integrated exhaust tips are well executed and help break up the plastic. If the GL conveys its size anywhere, it’s viewed from the stern. With a tall, frameless rear window, the model can’t help but look monolithic. If anything, that’s a comment on how excellently designers have managed to proportion the SUV’s exterior. On the road, the GL simply doesn’t look as big as it is, despite boasting a 121.1-inch wheelbase. That’s 5.6 inches more space between the wheels than the Cadillac Escalade, despite the fact that the Cadillac is over an inch longer from stem to stern. That stretched wheelbase, wider body and taller roof translates into a cavernous cabin. All told, the GL delivers 143.6 cubic feet of cabin volume, with up to 93.8 cubes of cargo area with both rear seat rows stowed. Speaking of sending the back seats packing, the second and third rows are now mechanized, which means getting the second-row buckets to stow is as simple as mashing a button. The same goes for the way-back bench as well. Compared to Audi MMI or Cadillac CUE, COMAND is beginning to look more than a little rusty. Escalade buyers will enjoy an additional 15.9 cubic feet of cargo area, but only without the third-row option. Throw the back bench into the mix, and the chrome-plated Caddy sees its figures fall to Mercedes-Benz territory. 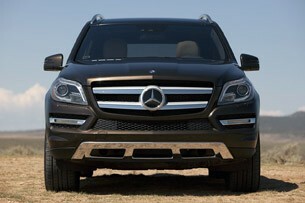 Step away from the numbers a bit, however, and the 2013 GL450 easily outclasses its competition inside. With an upholstered dash that boasts fine double stitching, attractive leather options and absurdly adjustable front bucket seats, the GL-Class is a few millennia ahead of its ancient American rival indoors. That’s not to say all is well in the Silver Arrow kingdom. We found the front seats to be a bit too stiff for long stints in the saddle, and the COMAND infotainment interface is starting to show some grey hairs.The seven-inch LCD screen lacks a touch interface, and the old console-mounted dial-and-button system can be clunky and distracting. Menu options are far from intuitive and the navigation renderings look lifted straight from 2005. Compared to the Audi MMI or Cadillac CUE systems, COMAND is beginning to look more than a little rusty. That said, the Escalade still soldiers on with GM’s last-generation navigation at the moment, though the next chapter in the SUV’s evolution is right around the corner. Buyers will likely see the top-tier Escalade bow with CUE next year for the all-new 2014 model. When that happens, Mercedes-Benz should be worried. The optional Airmatic system can increase ground clearance by a staggering four inches. 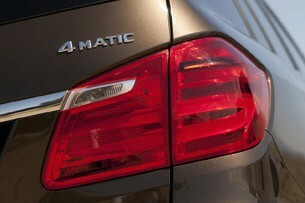 The 2013 GL-Class comes with 4Matic all-wheel drive as standard equipment, though buyers can choose from three engine options. Mercedes-Benz says the vast majority of buyers will wind up going home with twin-turbocharged, direct-injection 4.6-liter V8 in the GL450. 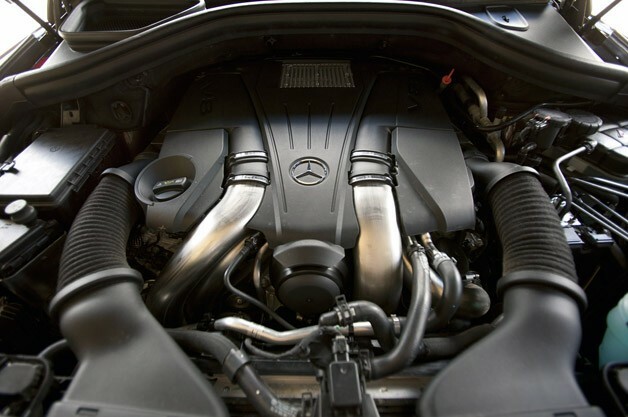 The engine delivers 362 horsepower and 406 pound-feet of torque, which is more than adequate enough to kick the ridiculously heavy SUV down the highway. Official estimates put the run to 60 miles per hour in the 6.2-second range thanks in part to the seven-speed automatic transmission. TheEnvironmental Protection Agency hasn’t released official mileage figures just yet, though Mercedes-Benz estimates the combination is good for 14 miles per gallon city and 19 mpg highway. Those numbers aren’t outstanding, but they aren’t horrible for a vehicle that tips the scales at 5,401 pounds. Engineers have worked hard to mask the machine’s mass, but outstanding acceleration aside, the seven-passenger behemoth feels heavy from behind the wheel. Each GL comes standard with the Mercedes-Benz Airmatic air ride suspension, which does an excellent job of mitigating body roll and soaking up imperfections in the road surface. Our test route took us down a heavily washboarded dirt road, and the GL450 absorbed the worst of the undulations at speeds up to 50 mph. The design also allows the driver to select a ride height for any given situation, and the optional $2,800 off-road package lets the Airmatic system increase ground clearance by a staggering four inches. Expect to find additional skid plates and two locking differentials as part of the kit. Like most modern SUVs, the 2013 GL is equipped with an arsenal of driver aids designed to keep the machine on course in any situation. Engineers rolled in a new crosswind stabilization system that senses strong gusts and uses brake application to countersteer the vehicle without driver input. Buyers may also opt for a $2,800 Driver Assistance package that includes a pre-collision warning system and active braking to slow the GL before an accident occurs. In addition, the pack rolls in Blind Spot Assist and Active Lane Keeping Assist. While we’ve found the latter system to be novel on other Mercedes-Benz products, it feels heavy-handed on the GL. Get too close to the lines on the road, and the SUV will nosedive as the brakes coerce the machine back on course. The GL-Class is based on a unibody chassis borrowed from the Mercedes-Benz S-Class. 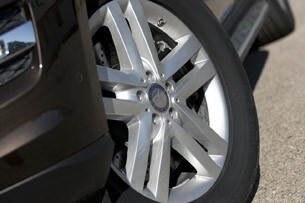 Speaking of brakes, the GL has some impressive stoppers on hand. On GL450 and GL550 models, 14.8-inch ventilated and perforated rotors handle dissipating heat, while 13.6-inch pieces pull similar duty out back. Even so, the pedal lacks a positive bite on first application, requiring the driver to dig deeper to come to a full halt. From behind the wheel, the GL can’t help but feel like a big crossover, thanks largely to the fact that more than any other “SUV” on the road, this beast cozies up the line between the two segments. With a unibody chassis borrowed from the Mercedes-Benz S-Class, the machine’s off-road pretentions are the only thing standing between it and full-on crossoverdom. That impression is underscored by the vehicle’s electro-mechanical power steering system. As in other applications, the setup is speed sensitive, offering single-finger steering at low speeds and firming up once the GL gathers its momentum. Even at a highway clip, inputs feel on the numb side, though we doubt buyers in this class will care. Those looking for a luxury SUV are likely to be more content with all the dynamics of a soft-driving crossover backed by the muscular V8 under the GL450’s hood. The current-generation GL has fought tooth and nail to best the Escalade at its own game on its home court. Mercedes-Benz reports the company managed to sell 25,139 GL-Class units last year, thereby becoming the most popular luxury SUV in the U.S. in the process. This new generation will only coax more buyers behind the wheel, and that’s saying something given the leviathan’s price tag. Technically, Mercedes-Benz will ask $63,900 for the GL450, plus a $950 destination fee. That cash will buy you standard equipment like heated eight-way power adjustable seats, dual-zone climate control, Attention Assist and Collision Prevention Assist on top of a slew of other mechanical and comfort equipment. It’s worth noting, however, that Collision Prevention Assist won’t actually engage the brakes to avoid an impact without the $2,800 Driver Assistance package. Its price puts the GL at a disadvantage against the Jurassic Escalade. And here’s where the story turns unfortunate for the 2013 GL-Class. Our tester came loaded with $25,225 worth of options for a final as-tested price of $90,030 with destination. Keep in mind, this isn’t the powerful GL550 or the fire-breathing GL63 AMG. While the base GL450 is nicely equipped, taking advantage of three-zone climate control, the expansive available technology, special exterior colors and interior options will quickly swell the bottom line. While this is nothing new when it comes to German manufacturers, it certainly puts the GL at a disadvantage against the Jurassic Escalade it just dethroned. Buyers can slide $82,495 across the table for a top-trim four-wheel-drive Escalade Platinum. Make no mistake, the 2013 Mercedes-Benz GL-Class is built to coddle, and it does so with more interior room than ever before, genuinely attractive exterior styling and a drivetrain that’s only exceeded in refinement by the SUV’s suspension. Buyers who found lots to love in the previous generation will discover this newest iteration a welcome sight so long as the crossover specter doesn’t scare them off.